I happened to be over at amazon making some purchases and noticed that the three of my titles still retained by HarperCollins/Avon are being offered at a deep discount for kindle download. All three are only $1.99 each, instead of the usual $5.99! This includes my one and only Highland-set historical (The Sweetest Sin), and the first two books in my Templar Knights trilogy (Beyond Temptation and Sinful Pleasures). If you click on the title it will bring you to the sale page for each book. I have no idea how long the discount will last, so if you’re interested in trying any of these titles, now is the time. I’ve never seen HarperCollins offer any of these at such a deep discount…I’m considering it a Holiday “gift”! 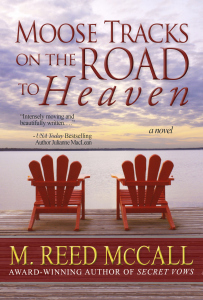 It seems there’s been a slight price drop over at amazon for the kindle edition of Moose Tracks on the Road to Heaven! It’s not a huge drop, but, hey, as a reader, I always go by the mantra that every little bit counts, especially for a long book (104,000 words or 347 print pages) like this one. PS: if you want to go right to the book at amazon to read more about it/get the deal, then click on the cover or the title link above. Or follow this link to get the same info/back cover blurb/excerpt right here on my website-blog. And that concludes my PSA for the weekend! Four of my historical romances – all medieval – originally published with HarperCollins/Avon and then re-released by me when rights reverted, are on a deeply-discounted sale for the time being: only $2.99 for eBook, and anywhere from $9.66 – $10.99 for the trade size print edition! The original eBook price for all was $5.99 and print was $11.99. Of course I also wrote three other historical titles that are still owned by HarperCollins/Avon; unfortunately I can’t get them back and so have no control over their prices. In looking at online purchasing sites, all three of those titles appear to be priced from $3.99 – $5.99 for eBook and $5.99 for mass market size paperback. You can tell which four of the seven titles are mine and which are still owned by HarperCollins/Avon by the style of the covers. Check out my historical books page for links to ALL of the titles HERE, or click on the covers below to be brought to each book’s individual page, with purchase links embedded there for your convenience.